Having a routine foundation inspection can alert any homeowner to weak or unstable foundations. If your foundation needs some sturdiness, you might consider installing helical piles. Here are five advantages to stabilizing foundations with piles. If your home is new or built on a floodplain or other unstable soil, you might be looking for a way to sure up your foundation. Piles are a perfect option. In fact, in many flood-prone or otherwise unstable areas, building codes are beginning to require the use of piles to stabilize foundations. If your home is close to another structure, you might have difficulty stabilizing your foundation. With piles, you won’t. Since your contractor can use equipment to install piles in tight spaces, stabilizing foundations with helical piles is a genuine option when the neighbors are close. Even better, because piles go in easily, you won’t have to deal with the sort of interruptions you would expect from other foundation stabilizing techniques. In many cases, your contractor can install piles to sure up your foundation in just one day. Even better, since they do not generally require concrete, you can probably move forward with the next phase of home construction immediately after your piles are installed. Whether you are building a new home or urgently repairing an existing foundation, you can load piles right away. If you need immediate support, it is hard to beat piles. Unlike other foundation strengthening techniques, piles are relatively environmentally friendly. With just a steel plate, some anchors, and a drill, you can stabilize your foundation without adding much pollution to the air or sending much debris to landfills. If you are looking for an effective way to stabilize your foundation, you should consider using piles. 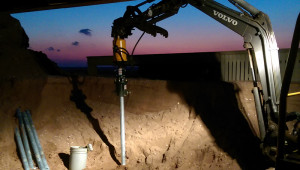 Stabilizing foundations with helical piles is not only effective, it is convenient.